All grain brewers can be obsessive about the efficiency of their brewing system. This week we will look at 5 methods you can use to improve your overall brewhouse efficiency. 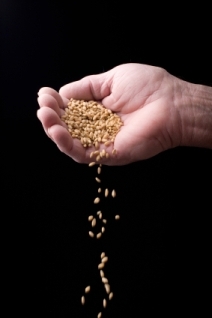 All grains in a beer recipe have a potential ideal yield, usually expressed as the find grain dry yield or potential. The fine grain dry yield is typically measured in laboratory conditions by powdering the grain and measuring the maximum possible extract. In the real world, only a fraction of the ideal yield is achieved due to mash inefficiencies, sparging limitations, deadspace and trub losses. The overall percentage of the potential grain sugars absorbed into the finished wort is called the brewhouse efficiency. Achieving higher efficiency on a consistent basis lets you use less grains to achieve a target original gravity. The crush of your grains makes a significant difference in the efficiency of your mash and sparge. Grains should be finely crushed, but the milling should leave the hulls largely intact to act as a filter bed. A dual roller mill such as the Barley Crusher is ideal for achieving this. Note that if you crush your grains too finely you will plug up your filter bed resulting in a “stuck mash”. If you get a stuck mash, your filter bed will clog up and the wort will stop flowing. Hot water during the mash out and sparge helps the sticky wort flow more freely. Ideally you would like to raise the mash temperature to about 168F and then use 168F water to sparge. A mash out infusion addition can be used to help raise the temperature of your mash as you sparge. Most beginners attempt to sparge their mash much too fast. Sparging too quickly leaves insufficient time for the hot water to extract the sugars in the grain bed. Limit the flow out of your mash tun to just above a trickle. It should take 30-50 minutes to fully sparge a 5 gallon all grain batch (about 6 gallons of wort). Losses anywhere in your brewing system, including deadspace in the mash tun, transfer lines, pumps, and trub at the end of the mash result in lost wort. The lost wort takes sugars with it, reducing your overall brewhouse efficiency. Use a properly sized mash tun, and work to eliminate deadspace in the system. The design of your mash tun and false bottom or screen can have a huge effect on the efficiency of the mash process. A round, cylindrical mash tun is generally considered best, as it leaves the depth of the grain bed about equal to its width. This is one reason cylindrical water coolers are popular. The false bottom ideally will cover the entire bottom of the mash tun but have minimal deadspace underneath it. This will provide an even flow across the entire grain bed giving better efficiency. If you have your own suggestions on how to improve brewhouse effiency, feel free to leave a comment below. Thanks again for visiting the BeerSmith Home Brewing Beer Blog. Don’t hesitate to subscribe for regular delivery. Have a great holiday and happy brewing. I have a cylindrical mash tun and have a developed technique to increase efficiency. All of your 5 points are very valid though I would suggest one more: establish a consistent grain bed. This is essential to ensure that sparge water flows evenly through the grain bed. Too fast of a flow can create water channels. Too slow can compact the grain bed and also create water channels to form. The goal is to rinse the grain column evenly. For me, this takes attention over 40-60 minutes but dramatically increases my efficiency. If I’m not in the mood for this, I just add more grain initially to compensate for the lack of efficiency! I keep my hot liquor tank at 180’F and start my sparge with adding 1/2 gallon of sparge water to the mash tun. I then collect about a 1/2 to 3/4 gallons from the mash tun and bring it up to a boil. After, I pour the boil back into the mash tun and stir to distribute the heat. For my 5 gallon batches, I do this once more to bring the grain bed up to about 170’F. VERY IMPORTANT, each time I pour the hot mash liquid back to the tun, I stir the grain bed to circulate the heat and to establish a consistent grain bed. When you pour out of the mash tun, the grain becomes compressed. Ideally, you want the grain bed consistently in solution so the sparge water flows through it rather than re-routing through compressed areas. After stirring each time, I allow about 10 minutes for heat transfer and grain bed settling. Patience and attention to the grain bed is a huge factor for efficiency! Keep posting, I enjoy reading your blog! Another suggestion to aid in preventing a stuck sparge, I always toss in a handful rice hulls. Never had a stuck sparge and always get great results. Great site and articles Brad, keep it up. Aren’t you going to start extracting tannins above 170? You are correct – I should have said 168 and not 178F. I will edit the post and make it 168F. Above all the steps you have been mentioned are really good to improve all grain beer efficiency and with those simple five steps it can be done easily. Assuming BIAB with a fine mesh bag, and because the grain bed is not used for filtering, can grains be pulverized to near flour? If so, what are the issues with using a home food processor to open the grain? I never tried BIAB, but I’m sure it’s still possible to get something similar to a stuck sparge. If you grind your grains into powder, you will likely end up with a solid mass, or dough ball that won’t allow the wort to flow through the grain. You may also have issues with cloudy beer because the bag might not be fine enough mesh to properly clear the wart durring vorlaufing. I had a hell of a time with my last tripple getting stuck. I’m not sure if it was the flaked oats causing the issue, or that I switched from HERMS to Direct Fire RMS. I’m using a 10gal Blickman with a Blichmann BoilerMaker with Button Louver False Bottom. This is only my second mash in the Blichmann, so it could also be the false bottom. Anyone have any tips or theories on this? It’s best to have a filter of grain hulls in BIAB as well, because when you lift the bag from the brew pot you’ll also remove wort that’s been soaked up and trapped by the grains. The bag will typically contain around 4kg of malt plus at least the same amount of water at approximately 70C, so you will want it to drain as quickly as possible to avoid scalding your hands. You’ll also reduce wort wastage that way. I have found that the best way to increase efficiency, in addition to above, is to use the trickle effect. We let the grains sparge for about 45 minutes then slowly pump the wort back into the kettle through the false bottom. This circulates the wort to make a more even flow through the grain. We haven’t hav a problem with a stuck sparge and do a medium grind. Also, you can find calculations for the amount of grain being used and air temperature to give an accurate temperature needed for the water to be used. Using these calculations, the water temp drops as it is added to the grain to release the maximum amount of usable sugars withoug overheating the sparge. Dough-in: Proper stirring to get rid of dry spots is especially necessary for larger grain bills. Amount of water for mash: I used formulas for my initial guesses, and kept adjusting until I was able to get 3.5 gallons of wort out of the first running, and a little over 3 gallons out of the second – while achieving a mash temperature of 156 after dough-in. This was the final piece of the puzzle. Nice article. I follow maybe 3 out of 5 of these suggestions and I get reasonable efficiency. I actually had to double-take and make sure that wasn’t my hand. Has anyone considered using a simple medium flow, food safe, high temperature (mouthful) pump to circulate the water in the mash tun? I am considering it, but I wanted to get some more experienced individual’s opinions. The idea is that I would only do one wash and use the liquid from the normal second wash (about 1.5 gallons) to increase volume of the water the mash out and sparge runs, which would hopefully be enough to keep the grain in a more suspended state. Any thoughts? I use a 10 gal insulated water jug and use 4 foot of stainless mess tubing I pulled out of hot water line for washing machine. I always got clean wort and use all my water at the same time. take it from the spigot reheat to 168 and sparge back in for 30 minutes. works every time. even on a 22lb grain bill for my Porter. I agree with Dean above regarding pH. I measure all my mash variables (mash temp, mash duration, mash thickness, pH, sparge temp, and sparge duration) and periodically analyze them using multi-variate regression. Turns out that pH is the most significant variable for my system… by a large amount. My tap water has a pH of about 8 so I started treating it with food grade phosphoric acid down to about 6, which usually gives me a mash pH of about 5.3. I’ve gone too far a few times, and when mash pH gets down to 5.0 to 5.1 my efficiency falls off dramatically. I also add a little gypsum since my water has almost no calcium, but this has not had a measurable affect on my efficiency (based on the analysis above). I continue to do so because I think it helps with my typical fermentation, but I’ve yet to analyze and prove that. In summary, rules of thumb are great starting places, but get a good thermometer and pH meter, record your data meticulously, and make decisions for your system based on facts and analysis. There really is no need to guess on this stuff. Good info, I have been having some efficiency issues. I think my crush is off. So I have a 100qt stock pot that I use for my mashtun, and it only came with a 12in false bottom… Im assuming I need a bigger false better to improve my efficiency. My efficiency runs from 60 to about 68. I mash in more slowly and I also sparge really slow… I do an iodine test and it shows that I’ve hit conversion. Where am I missing? Good info. I’ve struggled a bit with efficiency too. Will be putting this to the test with my next brew. Talking about sparge flow, sounds specific to fly sparge. If I’m batch sparging, does that translate to simply letting the sparge water sit 15 minutes before draining? (I do a two step batch sparge). Also, with regards to milling. I just did my first batch with a Monster Mill 3 (3-roller) at the factory setting of 45 thousandths (double-checked this with feeler gages). My efficiency was still poor (about 62%). Would milling finer help, or is that asking for trouble and 45 thou should be good? A very simple but effective way to increase efficiency is to stir your mash several times during the mash. I have a 3-pot system so I can turn a flame on for a bit while I stir, to keep the temperature steady. Keeping a steady temp in a cooler while stirring may be more difficult, but I am truly a believer in stirring the mash during that time. I sparge for at least 90 minutes, and sometimes up to 120 minutes. This has brought my efficiency from 65% to 80%. Before we were sparging for around an hour. Definitley pay attention to sparge time. Also, we sparge with 170 degree water, no mash out needed. I’m happy with 80%. I relatively new to the home brewing scene and am a bit confused by the required liquor/ mash volume. For example I’ve read that as a rule of thumb your should use 4x your grain bill I.e 5kg would require 20 L, however in the book Home Brew Beer(Greg Hughes) for example American Pale Ale recipe states 15 L for 6kg of pale malt. Yet another recipe for American IPA (14B)yours I think?) states volume of 40.3L for a grain bill of 7.1kg. Can you also advise the most efficient way to spare when brewing in a bag perhaps? I know this thread is a little old but I just recently achieved my best brew house efficiency of 79% so I thought I would throw it I anyways. It was by accident. I usually follow all the above recommendations, but this particular brew I had a bad stuck sparge. To fix it, I spooned out all the grains from my mash tun, cleared the clogs, put the grains back it the tun, waited another 30 minutes, and ran wort back over the grain bed until clear. I don’t know if I achieved the higher efficiency because my sparge took 30 minutes longer than my normal 45 minutes, or if all the spooning of the grains released more sugars. No one wants to deal with a stuck sparge, but I’m almost tempted to recreate to see if I can achieve that efficiency again. No… You should almost never be mashing that high. 154 would be a better number to throw out if your only going to give one temp, but mash temp varies with beer. Your beers must be terrible. Great forum. Just completed my 5th all-grain batch after several years of mini-mash brewing. Brewed a straightforward IPA yesterday. 5 gal batch. 13 lb grain bill, target mash efficiency of 76%, hit 71.2%. Perfectly happy with that (for now), though much more concerned about volume losses from the mash tun. Using a 10 gal MegaPot w/ Titan false bottom. Batch sparged with 168 deg. water for 10 mins, then recirculated to establish the grain bed. Drained for about 15 mins into the kettle. Had to top off with 1.5 gallons (!!!) to get to hit my pre-boil volume target. Any hints on ways to improve volume coming out of the mash tun? And your parties must be a blast, Kyle. Improving the boiling intensity is also one choice. As if based on a low boiling intensity, the amount of water evaporated in unit time is low, just mean the mixed wort concentration cannot be too lower, that may influence the amount of sparging water and influence the efficiency. I’ve always wondered what the sparge water temp has to do with Tannin extraction. Stated as such, sparge water should be kept lower than 168F, to avoid Tannin extraction. Isn’t the Tannin extraction based on the pH of the sparge water and not the temperature? If it were based on the temperature, how would a decoction mash ever work? A Decoction mash is conducted by boiling a portion of the grist and returning it to the mash to raise the temperature of the mash. It seems that this would extract Tannins at an alarming rate? It seems like the pH should be the main concern with Tannin extraction. In my opinion, it’s more important to have consistent efficiency than high. If you’re consistently getting 65% by draining your mash tun in 15 minutes why would you wait an hour and a half to two hours to save $3 worth of grain? I don’t have time.